Running into the office last week carrying a bundle of 8-foot bamboo poles, along with a picnic blanket, an iron and a bag of sand, we reflected on the changing role of the academic. Our unwieldy baggage was just part of what was needed for the shadow puppet play that lunchtime – a collaboration with the ‘Play of Light’ theatre company – translating research on family experience of coma into a puppet performance for an audience of medical students, care home workers, and lawyers. We’ve been collaborating with a wide range of artists to ensure that our research findings are accessible beyond academia. 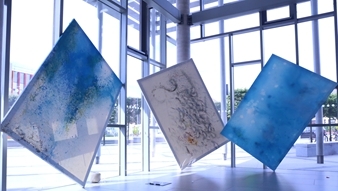 The performances, poetry, music, and art developed through such collaborations bring the research findings into dialogue with creative artists – inviting imaginative engagement and seeking to open out the debate about the vegetative or minimally conscious state. 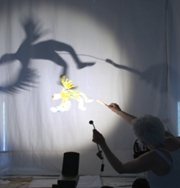 You can catch a glimpse of the strange beauty of the shadow puppetry here – where it features as part of a short film made to celebrate the impact of our work. Or listen to our Radio 3 programme using voices from research interviews alongside some of the specially commissioned music and poetry. Academic articles in peer-reviewed journals map out the research findings and theoretical context and implications, but other interventions and collaborations help research findings to have impact. For us this has meant organizing public engagement events, contributing to training for professionals, intervening in policy debates and sitting on working parties. Key findings from our research informed the House of Lords Select Committee on the Mental Capacity Act, and the Royal College of Physicians’ national guidelines on prolonged disorders of consciousness. The internet offers exciting opportunities for capturing and communicating research in new ways that can dramatically extend the reach of research. 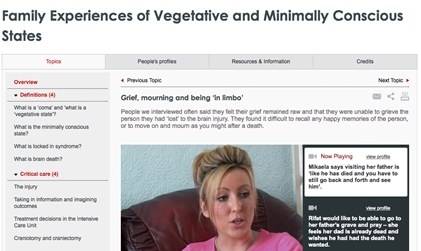 An ESRC Knowledge Exchange grant, along with support from the Health Experiences Research Group at Oxford University and the DIPEx charity, allowed us to film some of our research interviews and use them as part of a multi-media online resource about coma for the healthtalk.org site. On this site patients’ families – and health care practitioners who work with them (or anyone interested in the issues) – can watch more than 250 film clips addressing different aspects of the experience from families’ point of view, along with short explanations from a leading neuro-surgeon, an intensivist and two neuro-rehabilitation specialists. The resource explains definitions (e.g. ‘vegetative’ or ‘minimally conscious’), provides insights into what it is like at the bedside, and provides contextual clinical and legal information. There is a whole section on ‘impact on the family’, another addressing ‘ongoing decisions’ about treatment, and a section on ‘death and dying’. By bringing together detailed analysis of interviews with 65 family members (alongside relevant professional experts) – and combining this analysis with illustrative examples from research interviews – our work has become far more effective than if it had been limited to publication in academic journals. The site has been used by over 4000 people. Last week we were delighted to receive joint first prize from the ESRC for ‘Outstanding Impact in Society’ 2015. The award is a tribute to the commitment of all the families and practitioners who helped make the healthtalk.org resource about coma become a reality. Professor Kitzinger and Celia Kitzinger are Co-Directors of the Coma and Disorders of Consciousness Research Centre.